New York Observer columnist and editor Golway (For the Cause of Liberty, 2000, etc.) rescues a Revolutionary War hero from oblivion, and deservedly so. 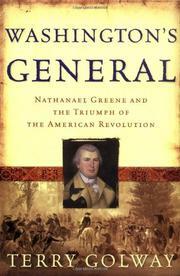 Nathanael Greene was a Rhode Islander who mysteriously earned a promotion from private to general of militia almost overnight, and who otherwise embodied a bundle of contradictions: he was a nominal pacifist who excelled at warfare, a pious man who was fond of a visit to the alehouse, “a walking incongruity: a self-taught child of the Enlightenment, dressed in the unadorned black garb of a Quaker.” When textbooks mention him at all, they tend to cast Greene in a saintly light, whereas Golway accords him all the usual human failings. Among other things, the man wasn’t above politics; he grumbled about George Washington’s failings as a commander and lobbied hard for position, especially against rival general Horatio Gates, though he skillfully depicted himself as being the unwilling recipient of rank and honor. And he was also, Golway hints, not above earning a dollar here and there by helping mercantile relatives gain access to lucrative army contracts. Greene also had positive qualities, however, that more than matched his shortcomings, one being sheer bravery; he uncomplainingly turned up in the thick of important battles, such as the Continental victory at Trenton and defeat at Germantown, and at the end of the war his mere appearance on the battlefield, apparently, was enough to send his British foes into flight. Greene had a simple view of the war: “We fight, get beat, rise and fight again.” That persistence wore down royal forces in the South, with the last battles of the Revolutionary War. At places like Cowpens, the Dan River, Guilford Courthouse, and Eutaw Springs, Greene met everything the British threw at him, and if he lost many battles, he at least kept up a fight that would have been all too easy to abandon. A fitting and welcome monument to a surprisingly complex actor in early American history.